As a Christian travel agency we know and understand the beauty of the story of Jesus Christ and the life changing message it brings. From the very start our DNA has been centered on the Gospel. Taking care of your group and individual travel is more than just planning your flights. Our hope is to build a partnership with you and understand the work you are doing while on your mission trip. 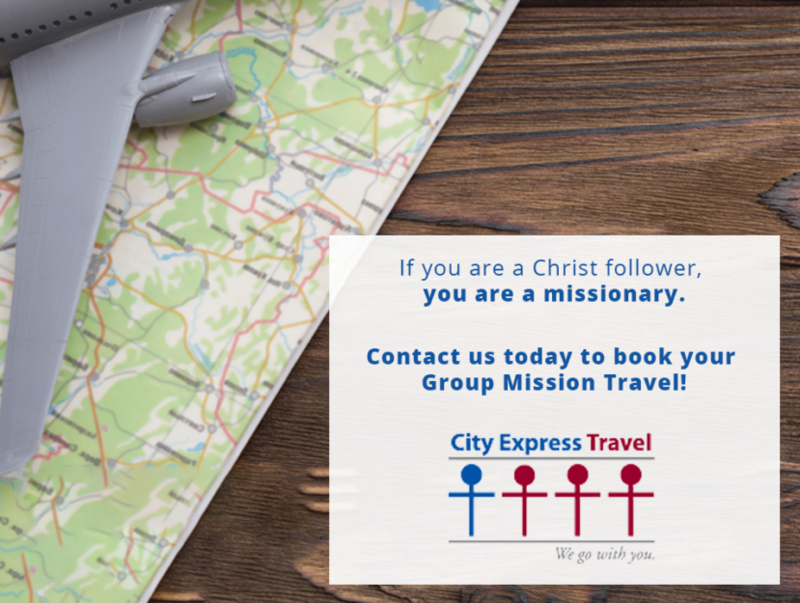 For over 30+ years City Express Travel has been helping book airfare and send thousands of people all across the globe to serve. From short-term mission trips, to long-term mission trips we have partnered with the mission community to share the love of Christ to those who have never heard it. Through years of partnering with church pastors, lay people, and mission teams we have learned what your needs are, and use our extensive knowledge of the travel industry to book your unique trips. As the industry has shifted, we have become a pioneer in developing mission travel programs. It is that experience in Group travel and Individual travel that has allowed us to serve to such a large community. Matthew 28: 19-20 says “Therefore go and make disciples of all nations, baptizing them in the name of the Father and of the Son and of the Holy Spirit. Teach them to do all the things I have told you. And I am with you always, even to the end of the world.” We believe that lives can be eternally transformed by a mission trip. The simplest act of kindness and compassion change of someone’s life forever. As believers, our calling is to share the light in a dark world, and what better way to do that than serve is missions. Whether we serve in our own backyard or travel to the ends of earth, the power Christ can give us to bring hope to this world goes beyond words. For us it’s more than just planning your flights. We know and understand the Mission of the Gospel and the important calling it gives to love and serve others. Our hope is to partner with you in making that process as simple as possible so you can focus on other aspects of preparing for your trip. Our partnerships with the airlines allow us to negotiate and find the best possible fares out there to help you be a steward of your resources. After you have submitted your travel quotation form, we will work our hardest with the airlines, wholesalers, and ticket-suppliers to find the lowest airfare possible. We’ll walk with you every step of the way; from the moment you call with a request to the minute your group lands back home.